May 27th, 2012 – It was a warm autumn day, the skies were clear, the winds were low and the adrenaline was high. I had just boarded a plane wearing a jumpsuit, a helmet, and last but not least, a parachute on my back. In just 10 more minutes, the time it takes to get to 4,000 feet above ground level, I would be exiting that perfectly good aircraft solo – for the first time ever. 10 Minutes can feel like a year when you are crammed into a Cessna 185 with six other people, and are about to engage in an activity that may very well be the last thing you ever do on this earth. Thoughts have a way of popping up – thoughts from your training, thoughts of malfunction management, thoughts of excitement; thoughts of death. I released my grip and fell. My chute opened. A sigh of relief – nay, a BELLOW of excitement – escaped me. I didn’t hesitate with my answer. Once the bait was dangled in front of me, I knew I had to take it. 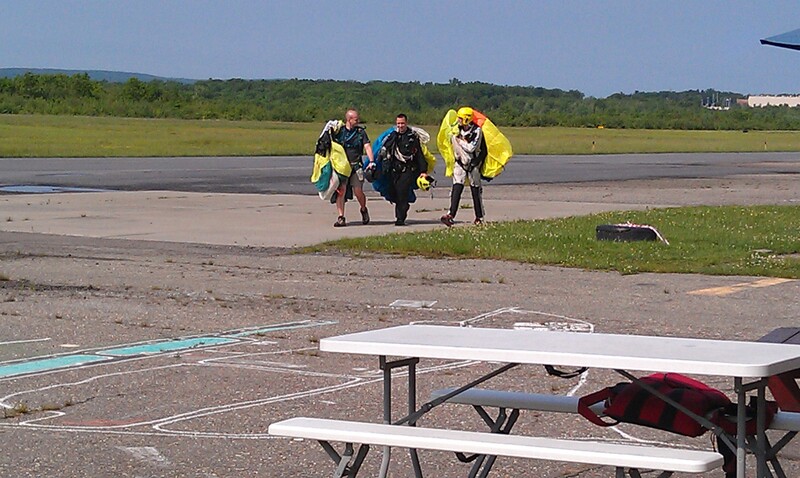 The day finally came, and a group of us hit the airport in Hazleton, PA where Above the Poconos Skydivers operates. The overwhelming feelings of excitement, adrenaline and uncertainty were overflowing from me. We all did our jump, which at the time seemed like a monumental, life changing event. I felt like my perspective on life rang true with a revitalized clarity. At the time, though, it was just something I did. Once. I knew I wanted to do it again, but life and money were in the way. Especially money. So two years later I organized another jump, in which I got a group of 18 people together, most of them first timers. This time I was so exstatic, as soon as I landed I signed up for the solo license introductory course. But I hesitated. I decided I would wait for another friend who singed up. Or was this just fear speaking? Was my conscience telling me no? Maybe so. As the weeks went by, he pushed it off, and I followed suit. The winter drifted in, and before I knew it, all momentum was lost. It was now another MONUMENTAL step in my mind. Joe no longer seemed interested in the course, and I put it on the back burner as well. Pretty soon, almost three years had gone by. At that point, it was out of sight, out of mind. Then one day I was going through my stuff, and found my skydiving movie, with the deposit receipt for the solo class inside. I took it out, called the drop zone and asked if it would still be good. To my surprise, they said they would honor it, so I penciled in the date and went full speed ahead. This time, I wanted the momentum to stay strong. Of course, I entered the hangar to open arms, a friendly staff and a positive learning environment. I joined my classmates – four of us. We got right to learning, covering the basics of free fall and canopy control, watching videos and using mock controls to learn the procedures. Once we were ready, and the weather was cooperating, we got up to do one more tandem jump and use our newfound knowledge with an instructor still in tow. That third tandem jump was a breeze. The task stopped seeming so profound. I went home to study what I had learned. I didn’t break. The next morning came quickly. My alarm clock was a screaming reminder that I would soon be using my freshly acquired skills, but this time the controls would attach to a real canopy, not just some sandbags hanging on a pulley. I arrived at the airport and marveled at the blue skies. My fellow classmates and I made some small talk as we geared up, checked our radios and went over our flight plans. When the instructor asked who wanted to go first, I didn’t hesitate to volunteer. I took some deep breaths and boarded the plane. To say I wasn’t nervous would be a lie. To say I wasn’t afraid would be equally fallacious. I could feel the nerves tensing, my palms perspiring. I knew this feeling well. The feeling in your gut that says “This is crazy! What are you doing?! You stupid idiot, you’re gonna get hurt!! !” Luckily, I cherish this feeling as one of the holy grails that life has to offer, and know it well from my snowboarding endeavors. I’ve found that recognizing any nervousness and reframing it as excitement is an effective means to overcoming those feelings and turning them into forward momentum. The difference was with other things in life, like snowboarding, once you commit to the danger and that feeling hits, you don’t usually have 10 minutes to simmer in it. Luckily, I had begun meditating regularly a few months back and had learned how to use mindfulness and trauma release exercises to fully immerse myself in the feeling of the experience, rather than my conscious observation of it. 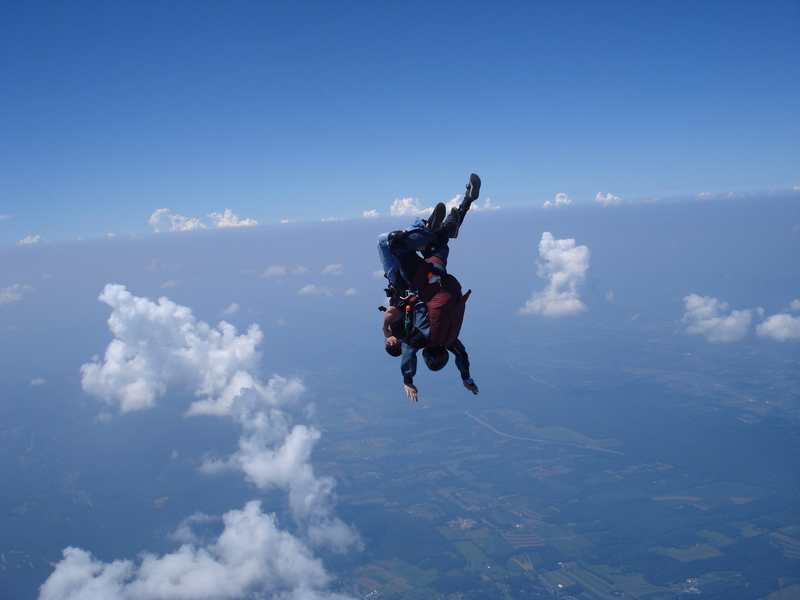 I sat back, closed my eyes, took some deep breaths and then began to visualize the perfect skydive. I kept one eye on my altitude, and one eye on the earth below to stay aware of my surroundings. A calming feeling enveloped me. The time came and I left the aircraft. That first time under canopy solo will live in my mind forever. I’ll never forget the overwhelming feeling of excitement once I realized my chute was open and operating correctly. I couldn’t help but to start belting out the song “Freebird” at the top of my lungs. After all, no one could hear me. Luckily. Each jump after that first one came easier and easier, and my demeanor became much more steady. But with each success, came a new level of learning, a new challenge to meet. It was like walking up a ladder. You got comfortable at a certain level, but each new step took some getting used to. On my first solo free fall jump, I was a bit nervous to not have any instructors there for back up. I exited the aircraft and went into an uncontrolled spin. From 10,000 feet to 6,000 feet, I spun the whole way down! I was nervous, and my body was tensed. I tried my hardest to counter the turn, but it just made it worse. Then I remembered possibly the most important words you could learn in skydiving. “Relax.” I took a deep breath and released the tension from my muscles. I stopped spinning. Over time I learned that while the new challenges presented to me may be daunting, if I approached them with a calm assertiveness, I could overcome anything. This has been important for me, not just in skydiving, but in life. With so much in life, you are better when you just relax. Pretty soon I was learning how to flip, spin, roll, and track forward and backward. Perhaps the most import thing was learning to relax through all of this. Things got easier, the fear drifted away. Not everything was always smooth though. There were some rough landings along the way. Hard landings that jolted me through my spine. Fast landings that sent me tumbling to the ground. Learning accuracy had me all over the place, once finding myself doing a baseball slide on the tarmac, leaving a nice gash in my hand. But each time I walked away, and I found that what didn’t kill me truly did make me stronger. More will power, more confidence, more in tune with myself. Until finally, it was time to do my check dive. The A-License graduation jump – to prove that you can become unstable on all axes and regain stability within an allotted amount of time. Having passed my check dive, there was really just one thing left to do, officially pack my own chute! That’s when things got sticky. I had done it a few times before under supervision, but I hadn’t concentrated on it as much as I should have. So it took a few tries. But I eventually passed and finally received my A-License. I was quickly introduced to beer rules – the cardinal rule in skydiving that dictates anytime you have a first, you owe your DZ a case of beer! But really, it made me start to realize the fact that pretty soon, no one but me would be in control of my own safety. I began to assume a new level of responsibility for myself. Not just in skydiving, but in every facet of my life. It was becoming more and more clear that the only person that could truly ever control my own fate is myself. And so becoming a licensed skydiver was not just a journey to becoming a person who jumps out of airplanes, but to becoming a person who lives his life to the fullest, without regrets, and for the pure joy of living a life worth living, on his own terms, taking full responsibility for that which goes right, and that which goes wrong. And that’s why I love skydiving. Because it’s a sport full of go getters. People who are willing to take risks and accept that one day the outcome might not be what they desired, but they understand it’s their own responsibility to do everything to ensure that it’s the outcome they expect. The people in skydiving don’t just jump out of airplanes, they make things happen. Above all, though, it’s a community. One that holds itself together on the strength of it’s own bonds. Bonds created through risking life and limb together. Bonds created through looking out for one another. Some of the best people I know were people I met through skydiving, and I have no reason to believe that there is any shortage of them remaining to be met. I look forward to the scenarios in which those future bonds are made! Nowadays, when I jump out of an airplane, the adrenaline rush is not quite the same. It’s still there, but my technique has improved and with it my confidence. Skydiving has taken me all over the United States, and into some of my most memorable experiences. And now, here where I sit writing this, a long way from home and a long way from the school in which I learned to jump, I remember the faces of those who made it easy for me to jump out of those daunting flying machines, the personalities that made me want to come back, the family that made me feel at home at Above The Poconos Skydivers. And to those, I feel forever indebted, because skydiving was not just a past time, but a catalyst for the change that my life ultimately experienced. So I’ll end by asking – What are you afraid of? Maybe it’s time you took a leap of faith, and truly found out. The United States Parachute Association – Learn about skydiving, where to skydive, the different methods to becoming a skydiver, skydiving statistics, and other information. Dropzone.com – The skydiving community, online. Buy and sell equipment, locate dropzones, rate dropzones, read, learn and discuss the sport.